Greetings again from the darkness. I like secrets too! By definition, information is scarce on these teams, so Secret Ops units are perfect fodder for intrigue, espionage, and geopolitical action flicks. A fictional account of an elite paramilitary unit chasing down Russian spies is not only timely, but also timeless. Director Peter Berg and actor Mark Wahlberg are back for their 4th testosterone-laced collaboration. Their previous work included PATRIOTS DAY, DEEPWATER HORIZON, and LONE SURVIVOR, each with an element of truth to their story. Not so with their latest … at least we hope not. 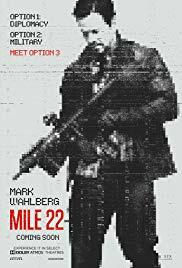 Mark Wahlberg stars as Mark Wahlberg, er… James Silva, a child prodigy with anger issues who has grown into a military intelligence prodigy with anger issues and a rubber band. Silva snaps the rubber band on his wrist when his impatience bubbles up as those around him can’t keep up with his rapid-fire thinking. The only thing that works faster than Silva’s brain is his motor-mouth filled with cryptic cuts and curses. Lest you think this is another men’s only club, writers Lea Carpenter and Graham Roland have blessed us with two female action figures. One is played by MMA star Ronda Rousey. She is given little to do here. The other is Lauren Cohan (“The Walking Dead”) who, as team member Alice Kerr, has much to do – even beyond the absentee-mommy guilt burdening her. Carlo Alban plays another member of the elite squad, while John Malkovich plays “Mother”, the flat-top toupeed control center leader … you knew there had to be an ultra-high-tech lair staffed with computer nerds. Since Wahlberg spends most of the movie yelling, and Cohan battles her estranged husband (Peter Berg cameo) over Skype, the most interesting character is Li Noor, played by Iko Uwais (THE RAID). Uwais brings a Bruce Lee quality to the film with an incredible hospital room fight scene, as well as a few other sequences that will have you marvel at his abilities. Intensity and tension and violence and gun play and fighting and chase scenes are jam-packed into a relatively short run time, but the opening sequence is the closest thing we get to something that fits into a well-written espionage thriller. The team sets up a raid on a Russian FSB suburban safe house. Things get twisted, and the final kill ends with “you’re making a mistake”. The film then jumps ahead two years to the Overwatch team reassembling in Southeast Asia for a mission to transport Li Noor to an airfield 22 miles away. See, he holds the information regarding dirty bombs that can either save or cost thousands of lives. The film features a framing device with Silva being debriefed after the mission. He is explaining why they do the important work they do and why they did the important work they did and why it’s important that we understand the work is important. There is government bashing and military cheerleading, but mostly the interview acts as a respite between violent action sequences. The film plays so much like a video game that each ticket should come with a joystick. If after watching this, you need more, you’ll be pleased to know there’s a cheesy line at the end that tees up the sequel … and don’t worry, director Berg and Mr. Wahlberg are already in pre-production for their fifth film.